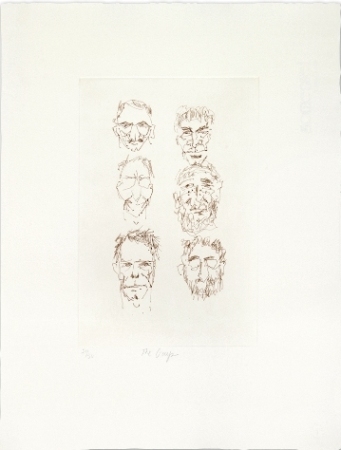 “The Guys” 6″ x 9″ image is printed on 11″ x 15″ sized paper fabricated and printed by master etcher (and Deadhead) Blue Acier Inc. in Tampa, FL. The etchings are printed on Somerset, 100% rag paper with the Jerry Garcia Family seal of authentication and Blue Acier’s official chop mark. A certificate of authenticity embossed with the Family seal and signed/numbered by Jerry Garcia’s daughter Trixie is included with each print. The etchings are limited to 50 with no reprints, and the first 20 will be available for $450. The next 20 will be listed at $750, and the final 10 prints will cost $1,000. The print is available for pre-order now in the Official Garcia Store. The prints will ship on or around July 22, 2013. The website says that, at the request of the Jerry Garcia Family, six additional impressions have been pulled as gifts for the six members of the Grateful Dead and their families. Photogravure is a photomechanical printing process. The print is made from a metal plate like an etching or engraving, using ink to form the image. A plate is made light sensitive, exposed to a negative, and then etched in acid. Jerry Garcia studied at The California School of Fine Arts, now known as the San Francisco Art Institute, and continued to paint and draw during his career as a musician. During the last years few years of his life, Jerry Garcia exhibited and sold his artwork throughout the U.S. His estate continued to exhibit his art after his death. In 2005, to coincide with the tenth anniversary of his death, a book of Jerry Garcia’s artwork was published titled, Jerry Garcia: The Collected Artwork. Visit the Pop Life Art homepage for links to the artwork of more than 100 singers, musicians, and actors. This was written by Lorrie. Posted on Saturday, July 13, 2013, at 11:03 pm. Bookmark the permalink.